Off-Road Land Rover Parts from Terrafirma! Straight from the UK, Terrafirma performance off-road shocks, springs and accessories are designed specifically for Land Rover models. Quality engineering, manufacturing, performance and value make Terrafirma the right choice for the off-road enthusiast. Choose a kit with the shocks that meet your needs, or buy the shocks individually - the choice is yours! Terrafirma All Terrain Shocks are great all-around performers with a tough and durable twin-tube, low pressure nitrogen-charged design to prevent foaming. All Terrains work best for highway use or light off roading. Low pressure nitrogen keeps the oil under pressure, preventing foaming and cavitation, which would otherwise result in heat buildup and shock fade. Terrafirma Pro Sport Shocks feature the same twin-tube nitrogen design but come 2" longer than stock for added travel and feature velocity-sensitive valving - the shock automatically adjusts damping so the harder you punish them, the better they work. 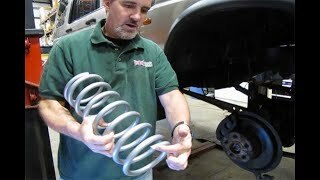 Terrafirma 'Pro Sport' shocks are a step up in performance and quality over 'All Terrain', and are designed to work with Terrafirma coil springs and their 2" (50mm) lift in medium to occasional heavy duty use. Pro Sports are also built with the largest possible fully welded mounting pins and rubber bushes for maximum strength and durability. Terrafirma Big Bore Shocks are made for heavy expedition or towing vehicles. They feature a massive 76mm diameter body, 50mm shaft with ample spacing for high performance oil to keep shocks cool. Big shaft, big bushings, good for 2" of lift! We also supply a robust lineup of Terrafirma steering parts, hardware and accessories. Customers can find steering dampers for Land Rover Discovery Series I and II, Range Rover Classic and Land Rover Defender 90 and 110 models. We carry all of the Terrafirma brand shock towers, relocation cones, spring spacers, bump stop extensions, wheel spacers, rock sliders, retaining plates and more! Plus we have Terrafirma Rock Sliders for Discovery Series II and Defender 90 vehicles. All of your needs covered by one dependable Land Rover part source!